You might be happy with just blasting away rather than mastering the Red Dead Redemption 2 Sharpshooter Challenges, but it's worth improving your aim. Complete these challenges and you can unlock all sorts of rewards like new holsters, outfits and other bits of gear to prove you really know how to shoot. You can only take on one challenge at a time but follow our Red Dead Redemption 2 guide and you'll be able to tick them off in no time and complete every single Red Dead Redemption 2 Sharpshooter challenge before high noon. This one’s easy enough, as any bird will do. Just find a flock of feathery friends circling in the skies above or sheltering next to rivers, use the auto-lock system or Dead Eye to get your weapon (preferably a bow) on target, and fire away. This can be completed with any types of species, so whenever two different animals appear on your screen, activate Dead Eye targeting and line up your shots, before unleashing the shrapnel for an easy challenge completion. You know the drill. Hop onto a moving train, get out your gun, try to avoid the peeved off lawman, and shoot down five birds as soon as you spot them in the sky. Use Dead Eye if you’re struggling to get your sights perfectly on each avian target. You can buy tomahawks from the fence near Emerald Station, but the real challenge is getting a kill by throwing over 80 feet. Once your Dead Eye ability has been upgraded enough, it’ll be able to target someone from 80 feet away, but even then, it’s quite a long shot. For best results, try sneaking up on an enemy, aim for the head, and charge up the shot so it can cover the distance. Better get that gun oiled up, you’re about to kill a KFC bargain bucket's worth of chickens. As I as I can tell, the best way to complete this challenge is to head over to a chicken pen in Valentine or Emerald Ranch, equip two pistols in either hand with dual wield, activate your dead eye, and fire into at least six of the cluckers with wanton abandon. Each chicken will die with one hit, so you only need to paint each feathery fiend with a single Dead Eye target to ensure maximum efficiency for completing the challenge. You can buy long scoped rifles from gunsmiths or receive one for free by playing through Red Dead Redemption 2’s campaign but, either way, 660 feet is not a distance to be sniffed at. The good news is that the challenge tab will show your record sniping distance within the 660 feet threshold, so you can get a good idea of how far away you need to be after the first few attempts. It shouldn’t need to be stated, but always aim for the head to ensure you land the kill. Use your Dead Eye to more comfortably target headshots for this challenge. If the meter is high enough, you may even be able to score all seven within the same Dead Eye usage, though there's no time limit between blowing each brain away. It should go without saying, but dying will reset the challenge so, uh, try not to die. To disarm an enemy, fire at their hands or arms in which their weapon is equipped, and they'll drop it in agony. Useyour dual wield and Dead Eye abilities for a better chance at acheiving 3 separate disarms without reloading or switching weapons, and the challenge will register as complete. 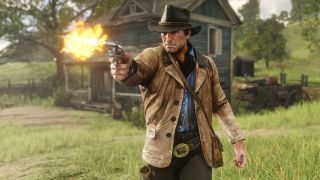 Hats can be shot off simply by aiming at them and opening fire, and Dead Eye should make this process even easier for Arthur, with the slowed time allowing for more precise hits. Of course, to knock three hats in the same Dead Eye use, there will need to be three hat-wearing enemies in your field of vision, so time it wisely. This challenge, being the last of the Sharpshooter set, is understandably tricky. You can buy long scoped rifles from gunsmiths in any town, but they can be quite unwieldy to use. For your best chance at killing three birds consecutively, equip a short ranged scope and try not to have too much distance between yourself and the flock of targets. Activate Dead Eye once your sights are set, and target stationary birds, such as ducks who often settle on the river bank, to make life easier once you start firing.